Written by: Hideaki Sorachi, Kyoko Shapiro, Honyaku Center Inc. Gin Tama Volume 13 cover image is courtesy of barnesandnoble.com. In an alternate-universe, aliens have invaded Japan and use Edo (Tokyo) as their base of power, forming a new government. Not only do these invaders, called the Yato, take all the good jobs, they also confiscated all the swords, and the samurai, who’d reached the pinnacle of power and prosperity, fall into decline. One samurai, however, held onto his fighting spirit. Sakata “Gin” Gintoki didn’t turn his back on bushido (“the way of the warrior”). Carrying a wooden sword, Gin becomes a “yorozuya,” an expert at managing trouble and handling the oddest jobs. Joined by his quasi-apprentice, Shinpachi Shimura, and Kagura, an alien wild girl, Gin takes on any odd job to make ends meet, even it means losing his dignity. In Gin Tama, Vol. 13 (entitled After All, Your Enemy of Yesterday is Still Your Enemy Today), Gin and company attempt to help an annoying (and ugly) mother find her missing son. Their search takes them to a host club run by a man name Kyoshiro, who is also in need of assistance. That puts Gin and his friends at odds with the Dirty Rat Gang. Then, Shinpachi’s sister, Otae, reunites with a childhood friend, Kyube Yagyu, to whom she pledged her love. Now, Kyube wants to marry Otae, but Shinpachi, with his sister complex, is ready to go to war to stop a marriage. THE LOWDOWN: It’s a sci-fi comedy and a samurai comedy, but in Vol. 13, creator Hideaki Sorachi focuses on all the crazy situations his imagination can conceive using the themes bumbling samurai, extreme comic violence, and bizarre characters. The storylines here are mostly free of appearances by strange looking aliens, but the mélange of criminal ruffians and rowdy samurai makes up for it. 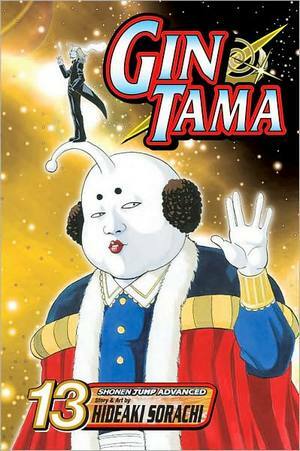 Gin Tama is another example of manga creators’ stunning talent and imagination for fashioning weird comedy concepts. POSSIBLE AUDIENCE: Fans of Yakitate!! Japan and Reborn! may like Gin Tama.